Why is H-1B visa abuse in the news? Why are Indian companies under suspicion as the chief abusers? Why does the lion's share of H-1B visas goes to Indians? Are H-1B visa holders replacing higher-paid ($95,000+ per year) American tech workers at significantly lower pay ($60,000 per year)? What proposals are under discussion to control this abuse? How has President Trump performed in his first two months since inauguration? Why has he lost the key battles for Muslim ban and Obamacare repeal/replace? Why is President Trump's ex NSA General Michael Flynn seeking immunity from prosecution before offering testimony in the investigation of Trump campaign's Russia links? Did he do something that could lead to his criminal prosecution without immunity? What possible impact would Flynn's testimony have on the Trump presidency? What are the objectives of the Saudi coalition force variously described as "Muslim NATO" or "anti-Shia" alliance? What signal does the appointment of General Raheel Sharif to head this coalition send to the world? Is it an endorsement by Pakistan of the coalition? How is Iran reacting to it? What are its implications for Pakistan's sectarian violence? Does America Share Responsibility for Rise of ISIS? The appointment of a popular Pakistani general to head a Saudi-led alliance of Muslim countries has set off a furor in Pakistan, amid fears that the move could exacerbate sectarian tensions at home. Pakistan’s government last week approved the appointment of a former army chief, Raheel Sharif, to lead the Islamic Military Alliance, a posting announced by Saudi Arabia in January. The alliance includes several dozen mainly Muslim countries with the professed aim of countering terrorism, although it has taken no significant military actions, least of all fighting the Islamic State in Syria or Iraq. Saudi officials have argued that the alliance’s Muslim identity will make it more effective in combating Islamic extremists, while sending a powerful message that Muslim countries reject their ideology. But critics note that the alliance does not include predominately Shiite states like Iran and Iraq, making it more of a Sunni military alliance than an “Islamic” one. Still, the appointment of Mr. Sharif would give the Saudi-led alliance a more international sheen. Saudi Arabia has also been seeking support from Pakistan for its campaign against Houthi rebels in Yemen and may be hoping Mr. Sharif’s appointment could bolster that effort. Saudi Arabia is a major donor to Pakistan and maintains close ties with its civil and military elite. It has appealed to Pakistan for military help with its campaign in Yemen against the Houthi rebels, who are aligned with Iran and belong to the Zaydi Shiite sect. But Pakistan has so far stayed out of the operation, which is being conducted by Saudi Arabia and a smaller coalition of Arab countries. Egypt, too, has turned down requests for help in Yemen despite receiving considerable financial aid from Saudi Arabia. Pakistan’s Parliament passed a resolution in 2015 urging the government to stay neutral in Yemen, where more than 10,000 people have been killed, mainly in airstrikes, since Saudi Arabia began its campaign. Now, the former army chief’s presence at the head of the Islamic Military Alliance could signal a change in policy, analysts say. Nasser Janjua, the Pakistani national security adviser, said last week that Mr. Sharif would play a visible, proactive role in the military alliance. Mr. Sharif will “use his experiences and knowledge to remove internal misunderstandings among Muslim countries,” Mr. Janjua was quoted as saying by local news media. He did not elaborate. Pervez Musharraf, a former army chief who ruled Pakistan as president from 2001 to 2008, was hugely popular as a general but faced a backlash once he shed his uniform and dabbled in politics. Mr. Sharif’s predecessor, Ashfaq Parvez Kayani, was also highly regarded, but became a figure of controversy after he extended his military term as corruption allegations swirled around his family. Mr. Sharif, on the other hand, remains untainted by charges of corruption or nepotism. In 2014, the last year for which information is available, just 13 outsourcing firms accounted for a third of all granted visas. The top recipients were Tata Consultancy Services, Infosys and Wipro, all based in India. The companies, which subcontract their employees to banks, retailers and other businesses in the United States to do programming, accounting and other work, often inundate the immigration service with tens of thousands of applications. Several bipartisan bills in the Senate and the House seek to make companies give more priority to American workers before they fill jobs with H-1B visas. They also seek to raise the minimum pay for the jobs, which depend on skill level and location: A computer systems analyst in Pittsburgh, for example, must make at least $49,000 under current regulations. The theory is that higher pay will eliminate some of the rationale for importing workers. A draft of a presidential executive order on “protecting American jobs and workers by strengthening the integrity of foreign worker visa programs” was distributed widely in late January but never signed. Then, without warning, Citizenship and Immigration Services published a memo on its website over the weekend that could affect many applications. Specifically, companies seeking to import computer programmers at the lowest pay levels will have to prove that the work they perform qualifies as “specialty” labor, which is what the H-1B visas were created for. “There will be greater scrutiny of the role the company wants to fill,” said Lynden Melmed, a lawyer in Washington and a former chief counsel for the immigration service. The measure appears to be directed mainly at outsourcing firms, rather than the big technology companies, which tend to hire workers at higher skill and pay levels. The group said that its members followed all the program’s rules, and that the change would have little impact. “It is aimed at screening out less-qualified workers, whereas our members tend to provide well-credentialed workers to help U.S. companies fill their skills gaps and compete globally,” it said. Even before the memo and the Justice Department’s warning, fears about the future of the H-1B program were making this year more pressure-packed than most. “Just to make sure the petitions get in, almost every client demanded that theirs arrive on the first day,” said Greg McCall, a lawyer at Perkins Coie in Seattle who prepared 150 applications. Inside the federal building, a formidable structure that has provided backdrops for movies including “Coma” and “Outbreak,” the logistical dance unfolded over two floors. In the mailroom, about 40 people wearing blue gloves sat around tables opening packages that arrived nonstop in six-foot-high bins. In a huge warehouse, those same packages were separated according to whether the applicants had bachelor’s or master’s degrees. All told, 1,500 workers were involved, with a second shift expected to stretch past normal business hours. “This is the day we prepare for months and months in advance,” said Donna P. Campagnolo, the center’s deputy director. Trucks came and went all day, with some couriers, including from FedEx, staggering their deliveries to avoid having dozens of trucks backed up at the gate. ...However, surprisingly, India fared poorly, ranking 26 out of the 28 major global tech hubs evaluated in HackerRank’s April 06 report (paywall). The coding recruitment platform rated each country on nine factors: corruption perception, english-language proficiency, competition for talent from other tech companies, average salary, rent, taxes, internet speed, STEM grads, and skill. Overall, Singapore topped the list because it had “the lowest taxes, fastest internet & exceptional talent.” Last year, the Singaporean government committed $19 billion towards R&D and the local engineering ecosystem, while Google expanded its office in the city-state to 1,000 engineers. Most importantly, India is the worst when it comes to the internet. An Economist Intelligence Unit study of internet inclusiveness ranked India first among 75 countries on policies to ensure connectivity. However, network availability and quality in the country were deeply flawed. A 3Q 2016 Akamai report says India’s 4.1 megabits per second (Mbps) average internet speed is Asia’s slowest. Frequent power cuts in pockets of the country and a sizeable chunk of the population—240 million—lacking power supply, only add to the chaos. As the Trump administration clamps down on immigrant workers, companies in the Valley—the biggest tech behemoths and up to 19,000 startups—will probably seek innovation hubs outside the US. Even otherwise, the region is approaching saturation. HackerRank designed an interactive tool that lists the top countries for users based on parameters that matter to them. “Large companies like Google or Facebook might care less about cost than a startup. Smaller, more agile companies may prioritize cost-effectiveness and skill level to hire developers who can start coding on day-one,” the report states. “If you’re anticipating overseas collaboration, then low corruption levels and language barriers could take priority.” For instance, despite its shortcomings, a company that values cost savings above all might find India favourable due to the low rents and cheap labour costs here. The following are HackerRank’s top five countries for collaboration, cost, and talent, and their rankings in the sub-categories used to determine them. "Putting American Workers First," reads the bold headline on the home page of the U.S. Citizenship and Immigration Services, proclaiming: "New Measures to Detect H-1B Visa Fraud and Abuse. "A click through to the April 3 statement outlines steps the agency will take to clamp down on the use of temporary visas for foreign workers in specialty occupations. Among the areas of focus: "Employers petitioning for H-1B workers who work off-site at another company or organization’s location. "Indian technology companies are in the cross hairs. Outsourcing providers such as Tata Consultancy Services Ltd., Infosys Ltd. and Wipro Ltd. are contracted by U.S. firms and government agencies to deploy programmers and engineers. This usually happens at the client's premises instead of their own offices: that is, "offsite." Indian nationals are so dominant in the H-1B program that they accounted for 195,247, or 70.1 percent, of all beneficiaries in 2015. PROPORTION OF H-1B VISAS THAT GO TO INDIANS70.1%Whatever the impact on these outsourcing companies, the crackdown is already hurting the net worth of their billionaire founders as investors anticipate tightened enforcement will hurt earnings, Bloomberg News reported Wednesday. Tata Consultancy has lost about 3 percent since the U.S. administration announced on March 3 it would suspend premium processing of H-1B visas, lagging a 2.8 percent advance in the benchmark Sensex index. A new study published by the data science team at Hired, a jobs marketplace for tech workers, shows why it’s becoming harder for software engineers to afford life in San Francisco, even while they make more money than their peers elsewhere in the U.S. and the world. Based on 280,000 interview requests and job offers provided by more than 5,000 companies to 45,000 job seekers on Hired’s platform, the company’s data team has determined that the average salary for a software engineer in the Bay Area is $134,000. That’s more than software engineers anywhere in the country, through Seattle trails closely behind, paying engineers an average of $126,000. In other tech hubs, including Boston, Austin, L.A., New York, and Washington, D.C., software engineers are paid on average between $110,000 and $120,000. Yet higher salaries don’t mean much with jaw-dropping rents and other soaring expenses associated with life in “Silicon Valley,” and San Francisco more specifically. Indeed, factoring in the cost of living, San Francisco is now one of the lowest-paying cities for software engineers, according to Hired’s lead data scientist, Jessica Kirkpatrick. According to her analysis, the $110,000 that an Austin engineer makes is the rough equivalent of being paid $198,000 in the Bay Area, considering how much further each dollar goes in the sprawling capital of Texas. 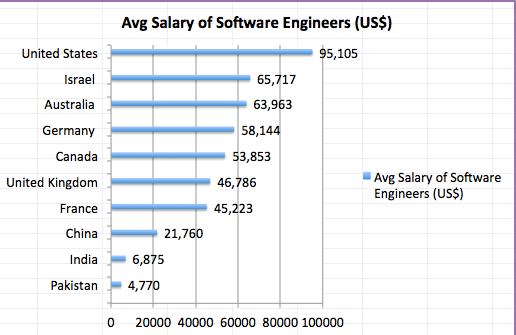 The same is true of Melbourne, Australia, where software engineers are paid a comparatively low $107,000 on average, but who are making the equivalent of $150,000 in San Francisco. In fact, Hired says it’s seeing a “huge percentage of our candidates” in other markets that are attracting and hiring relocation candidates. In Austin, says Kirkpatrick, 60 percent of job offers are being extended to and filled by people outside of Texas. Hired’s study explores a range of other data, including how much data scientists and product managers are being paid across 16 major cities and how that salary information has changed over time. Of greater interest to us, however, is another section focused on the impact of bias on salaries and hiring practices. It’s something Hired began following roughly a year ago by collecting voluntary demographic data from candidates and examining how their identity impacts the wages they ask for — and what they receive. Bias is nothing new, of course. In fact, in a survey released Tuesday by the job site Indeed.com, one quarter of U.S. workers in the tech sector said they’ve felt discrimination at work due to their race, gender, age, religion or sexual orientation. Roughly 29 percent of female respondents said they experienced discrimination, compared with 21 percent of men. Meanwhile, 32 percent of Asian and nonwhite employees said they were discriminated against, compared with 22 percent of white employees. Adopting a new "Australians first" approach to skilled migration, Prime Minister Malcolm Turnbull has announced that he will be abolishing the existing 457 Visa programme, currently used by temporary foreign workers to gain employment in the country. The 457 Visa programme is used mainly to hire foreign workers in the restaurant, IT and medical industries and the majority of such visa holders came from India, Britain and China, reported the Sydney Morning Herald on Tuesday. According to government statistics, 95,758 people were living in Australia under 457 Visa programme last year, with the highest proportion coming from India (24.6 per cent), followed by Britain (19.5 per cent) and China (5.8 per cent). Turnbull used Facebook to announce the policy, which he said would "put jobs first" and "Australians first", signalling a reduction in the occupations available to skilled foreign workers and raising the threshold to qualify. "We are putting jobs first, we are putting Australians first," he said. "We are an immigration nation, but the fact remains that Australian workers must have priority for Australian jobs." Stating that Australian workers must have priority for Australian jobs, he said: "We will no longer allow 457 Visa system to be passports to jobs that could and should go to Australians." At a press conference in Canberra, Turnbull said the 457 Visa system needed to be replaced because it had "lost its credibility". The scheme will be replaced by two temporary visas that will impose tougher English language tests, stricter labour market testing, at least two years of work experience and a mandatory police check. The numbers of jobs eligible for the two-year and four-year visa streams will be slashed, with 216 occupations ranging from antique dealer to fisheries officer to shoe-maker, axed from a list of 651 professions on the list. Accounting giant KPMG criticised the decision, saying "there is no evidence the current system is not working". However, Turnbull dismissed that claim, arguing the abolition of the 457 Visa regime was "a decision of my government... this has been a careful exercise in policy development", reported the daily. Craig Diangelo says at Northeast Utilities the fired workers pressured to stay and train their replacements launched a quiet protest. But it did happen, to Craig and Dawn and Leo and workers at hundreds of companies across the country. Former head of Homeland Security Janet Napolitano, now president of the University of California, faced a huge public outcry when she got rid of those 80 IT jobs at the Medical Center. She declined to give us an on camera interview, but stated publicly that the university, quote “didn’t use the H-1B process in the right way.” She instructed the Indian-outsourcing company to stop using H-1B workers. But that comes too late for Kurt Ho and Robert Harrison. Three weeks ago they packed up – their final day at the Medical Center. Robert Harrison: It’s gonna be a matter of time before everybody else feels the same burden, the same pinch, the same hurt that we’re feeling right here at UCSF. It’s a matter of time. President Donald Trump has signed an executive order to tighten the rules for technology companies seeking to bring highly skilled foreign workers to the U.S. The order Trump signed at the Kenosha, Wisconsin, headquarters of tool maker Snap-on Inc. targets the H-1B visa program. The White House says the program undercuts American workers by bringing in large numbers of cheaper foreign workers, which drives down U.S. wages. The order directs U.S. agencies to propose rules to prevent immigration fraud and abuse in the program. Trump says the order sends a “powerful signal to the world” that the U.S. will defend its workers, protect their jobs and put America first. He narrowly carried Wisconsin in November on the strength of support from white, working class voters. But Trump is currently facing a 41 percent approval in the state. TCS, the largest of India’s powerful IT services companies, set up the lab 18 months ago to enable new starters to work on the “internet of things”, the field of connected machines and appliances that is one of the company’s fast-growing areas of business — and one on which the company’s future depends. Since then, the young team has produced three ideas the company will now market to clients, including a system enabling technicians to find data on an appliance by looking at it through smart glasses and another that creates alerts when machines are at risk of malfunctioning. “We’ve moved away from the repetitive work — we’re getting a chance to learn something new each day, so it doesn’t become monotonous,” says Priyanshi Saxena, 23. But while the shift to disruptive new technologies has opened exciting new opportunities for Ms Saxena, it is fuelling concerns about the job prospects for others in her generation, as India agonises over how to find gainful employment for its booming adult population. The IT services industry, a totem of India’s increasingly modern, outward-facing economy, has been a powerful driver of skilled job creation over the past three decades, and employs about 4m people. While the sector continues to add new workers, however, employment growth has been slowing, lagging well behind revenue growth: 150,000 new positions were created in the sector during the last financial year, according to trade body Nasscom, down from 230,000 three years before. That trend reflects the increasing importance of new fields of business such as data analytics and connected devices, which Nasscom predicts will account for at least 38 per cent of industry revenue by 2025. This cutting-edge work tends to be driven by relatively small numbers of highly specialised workers, unlike the labour-intensive software installation and management work in which the companies first made their mark. With 1m young people entering the workforce each month, fears of insufficient job creation loom increasingly large in India. Demand for skilled labour has held up better than for blue-collar workers over the past five years, but “now seems about to conk off comprehensively”, brokerage Ambit Capital warned in February, noting structural shifts in the IT industry as a key factor. A further shadow over the IT industry has been cast by the election of US President Donald Trump, who has launched a crackdown on the H-1B visa programme for skilled workers as part of his “Hire American” agenda. But while this reform may weigh on margins, industry executives view the growth of automation and related areas as a more profound long-term shift. The speed of change means a growing portion of new jobs will be temporary, enabling companies to bring in specialists for a few months as required, says Puneet Bhirani, head of human resources at Mphasis, another IT services company. And while large numbers of highly skilled jobs could be created in the emerging areas, there are signs that Indian universities are not producing graduates with the relevant training, says Prasar Sharma at Mumbai’s SP Jain School of High Technology. Three years ago, Rashmi Kathuria decided she was fed up with the number of children leaving the school where she worked in north Delhi and not being able to find decent employment — so she decided to do something about it. Ms Kathuria, a maths teacher at the Kulachi Hansraj Model School, set up a young enterprise scheme to help pupils set up their own businesses and gain some real-life experience of the skills they might need in the workplace. The scheme was operated under the auspices of Teach a Man to Fish — an international non-governmental organisation that sets up similar programmes across the world. With two-thirds of its 1.2bn people under the age of 35, India has the world’s largest youth population — something that is both a blessing and a curse for the nation. In a recent survey of about 6,000 young people aged between 15-34, New Delhi’s Centre for the Study of Developing Societies (CSDS) found that 18 per cent of respondents cited unemployment as India’s biggest problem, while 12 per cent mentioned poverty and inequality. More than 70 per cent said they were anxious about their own job situation. India does not measure youth unemployment on a regular basis, but the latest data available, from 2012, show that just over 10 per cent of Indian people aged from 15 to 24 were out of work. This figure does not capture the very high percentage of workers in self-employment and informal labour, however. A 2016 survey from the labour bureau found that almost 80 per cent of India’s total labour force was either self-employed or working as casual labour. The CSDS study also found that self-reported unemployment rates are higher among graduates than among those without degrees. Other schemes are more focused on specific skill development, such as the Skill India Mission, launched by India’s prime minister Narendra Modi in 2015, which aims to provide training to 400m people by 2022 through various government initiatives. But for all the policy activity, experts say that young Indian workers still do not have the kinds of skills needed to give them the kind of high-value manufacturing jobs that will help to increase people’s incomes.